Minneapolis, Minnesota, USA, May 2, 2017; eCapital Advisors LLC, one of the nation’s largest performance management and business analytics firms has announced their availability at the 2017 Kscope event. ODTUG Kscope17 is the premier Oracle Developer Conference. The event attracts Oracle experts from around the globe. This year’s event will be held at the JW Marriott in San Antonio Texas from June 25-29, 2017. Throughout the event eCapital representatives will be onsite to support the company’s Oracle focused clients as well as to meet with prospects and partners. eCapital will also be hosting a Customer Appreciation event on Monday, June 26th at the RIO RIO Cantina on San Antonio’s River Walk. Complete details on the event can be found HERE. Those interested in scheduling meeting time at Kscope with the eCapital team can reach out to Steve Adam at (952)947-9300 or at sadam@ecapitaladvisors.com. 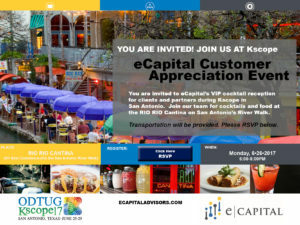 More details on eCapital’s User Appreciation Event at Kscope can be found HERE. More details on Kscope can be found at http://kscope17.com/ . eCapital Advisors is one of the nation’s largest performance management and business analytics firms. Since 2001, eCapital has enabled clients including Post Consumer Brands, Bunzl Distribution, Children’s Hospital’s, Northwestern University, Meredith Corporation, General Mills, Ecolab, and hundreds of others to make better business decisions through their high level software solutions and services. The company has been frequently recognized with numerous awards including Inc. magazine’s 5000 fastest growing companies. eCapital Advisors is privately held and headquartered in Minneapolis, Minnesota.